Imagine moving with the delicate speed of eight legs and looking out at the world through multiple eyes. Imagine floating through the air on a strand of silken gossamer and weaving a home from the imaginings of your inner self. Imagine living--receptive and open to the elements--listening to the vibrations and aliveness of the Web of Life. The intricate dance of Spider teaches us about the qualities of harmonic leadership and service, how to open into our visionary natures, and how to weave our medicine into the Web of Life for the highest good of future generations. Spider is the keeper of the North Direction: the place of the wise, responsible elder, the ancestors, and the season of winter. After the leaves of autumn have fallen, we come into a place of stillness. The richness of life--our experiences, lessons, and developed abilities--is carried within our beings. Our outward energetic expressions now turn inward. Our entire life journey has prepared us for this moment: to turn our attention into the stillness, into the void, into the cosmic darkness of galactic center. The winter of life, our elder years, is a rich phase in which we have the ability to make meaning of our past experiences, to find greater purpose for our long-developed gifts and abilities, to move increasingly beyond the mundane creations of physical existence into the spiritual, etheric realm. It is a unique opportunity to synthesize the meaning of our life journey with our increasing ability to enter the veils of universal reality. Spider reminds us that elderhood is a special and revered place on the Instar Medicine Wheel. We need our elders to empower themselves, to listen to the call of Spirit and teach us the wisdom they hear among the stars, from the call of wild birds, from the visions they receive from Universal Source. In the in-breath and out-breath of life, elderhood represents the moment in between--just as the winter is the quiet, still point between the disintegration of autumn and the new creations of spring. In the quiet of winter, we breathe fully into our bodies, feeling the rich oxygen permeate and enliven our cells. Then we begin the out-breath: releasing into spirit, into the veils beyond physical existence. There is a spark of possibility--the source of imaginal creativity--inherent in this moment. From this place, we connect fully to the Divine universe and through our beings come the weavings, dreams, visions, and wisdom of our Spider nature. We become the ancestral creator, keeper of the North, keeper of the new dreams for humanity and all creation. It is important to note that while human elderhood is usually found in the later years of the human life cycle, the wise elder can be embodied at any point of life. The developmental evolution of consciousness is a unique process for each person and is not limited to a certain decade or concrete definition. In addition, many beings are coming to Earth at this time who have within them vast wisdom, heart, and cosmic awareness. They need simply to be supported and sometimes activated by life to step in to their identity as wise cosmic elders. These children are pure dreaming conduits who have much to teach those of us learning to embody our sacred purpose in this lifetime. 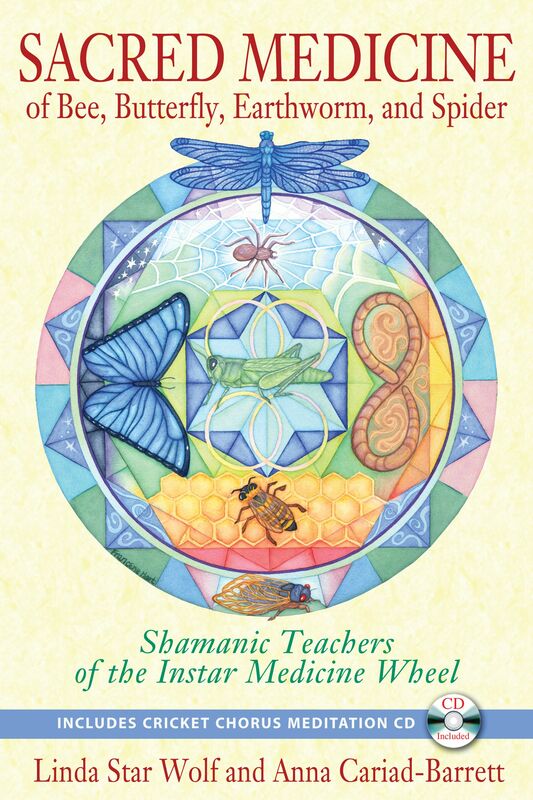 As we have discussed, the Instar Medicine Wheel is not meant to be a linear process. Rather, we spiral round and round, integrating and experiencing new facets of the archetypes throughout our lives. Spider teaches us that leadership is not about being a prominent, hierarchical figure who oversees life from above. Instead, we are encouraged to weave ourselves into the Web of Life, co-creatively collaborating, imbuing the web with our wisdom, and receiving the nourishment of the entire interconnected network of the universe. We cannot contribute and enhance the Web of Life, if we do not open ourselves to the essential learning and growth of human experiences. Through this Instar transformational process, just like Spider, we molt and evolve our consciousness into new forms, many times. We are transformed, and so we become wise shamanic elders and leaders--capable of transforming and harmonizing the web itself. - and weaving these dreams into physical form in service to future generations. Spider may appear to be solitary, but this an illusion. It has woven itself into the very fabric of the universe; swaying with the breeze, communing with the starlight, speaking and listening to the Web of Life. Sacred Celestial Grandmother, grant us now the gift of becoming dream catchers through your patient persistence in weaving the magical silk web from our heart’s secret longing into creation. Show us the way. Ancient One, teach us as we observe in wonderment and awe the sacred manifestation of what was once within yourself now cast as a sacred net out into the world, so that we too may remember that we have all of what we need deeply embedded within ourselves to attract and create our futures, while living in sacred harmony within the great Web of Life. Show us the way. May we learn to honor the wisdom of the wise elders and awaken the spirit of truth within ourselves. Show us the way.